A report on how climate change will impact water resources and affect EPA's existing water practices that aim to protect public health. The public comment draft also includes communications and outreach needs and goals. The report includes suggested communication, collaboration and training mechanisms for developing practitioner-based tools and increasing adaptive capacity. 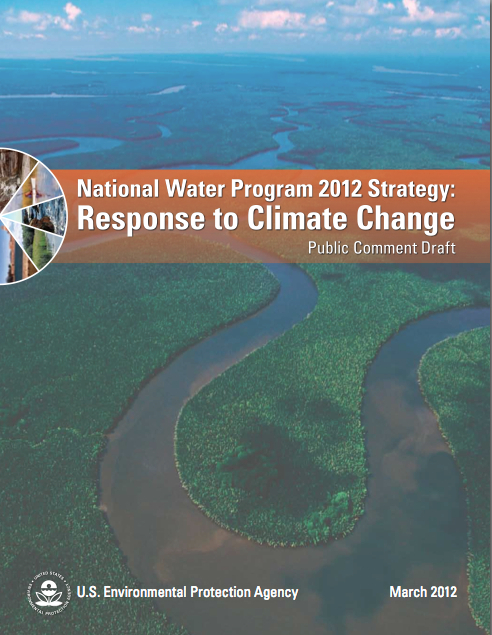 The EPA is accepting comments on the document through May 17, 2012. Many of the strategic actions outlined in the report are driven by the need for improved "translation" of climate impact projections, including regionally specific materials to help practitioners apply the tools. The document emphasizes the need to manage risk and incorporate adaptation into core programs through a "transformational" approach. "Climate change poses threats to water resources and the NWP’s mission"
"Ecosystem services are valuable resources for modulating climate impacts"
"Programmatic actions are being taken to address climate change"
"Information and tools are needed to inform action"
"Collaboration is essential for shared learning and problem solving"